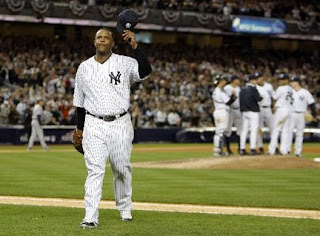 I have to admit that I was not expecting CC Sabathia to be named the #2 starter in the rotation. Last year, he was fighting Ivan Nova for the fifth spot, and this year he leap-frogs Michael Pineda? He went 9-12 last year, with a 3.91 ERA in 30 starts. Better than what we expected but certainly not front-of-the-line stats. At this point in the former ace’s career, I just hope that we get 5 solid innings with the game still within reach at the time of the hand-off to the pen…and a few Hail Mary’s for that knee. I get Joe Girardi’s logic. It’s better to give the first series opponent, the Tampa Bay Rays, different looks with the ‘righty-lefty-righty’ strategy. Still, I am not sure that I would have placed CC ahead of Pineda. In the grand scheme of things, I know it doesn’t really matter and Girardi is already on record saying that he’ll skip the #5 spot early in the season due to the number of days off during the month so the top four will get their turns. My prime objective: I want Michael Pineda motivated. If this is something that helps spur him to his potential, so be it. I still believe the success of the season depends upon Pineda. If he is able to produce a career year, this should be a solid season for the Yankees. Maybe not a World Series championship year, but they won’t be anybody’s pushover. I am not sure what to think about Luis Severino. He always looks incredible in relief but continues to struggle when starting. He finished off yesterday’s game with three scoreless innings in relief, with five strikeouts. More about the game later, but he is an enigma. I’ve heard people say that his only potential is in the bullpen with limited turns through an opposing batting order but I guess the optimist in me keeps hoping that he’ll put it together for a solid run in the rotation. I want him to succeed and I hope that he delivers in 2017. So, let’s say that Severino takes the #4 as originally expected. I think I may be re-thinking the #5 spot. Bryan Mitchell has been my favorite all spring but I am starting to climb aboard the Jordan Montgomery train. I love the guy’s size and his no-fear approach for throwing inside. As Daniel Burch has painstakingly detailed, Montgomery has proven himself in AA and AAA. I’m in. I am on Team Montgomery. Let’s give him the ball. Mitchell, go to the pen! Training camp is getting smaller. More players were re-directed to minor league camp for re-assignment. RHP Luis Cessa is out of the competition for the #5 spot with his departure. Others crossing the street are OF Clint Frazier, OF Dustin Fowler, OF Billy McKinney, 1B Ji-Man Choi and LHP Jason Gurka. If he shows maturity this season, I think Frazier will be a finalist for an Opening Day roster spot this time next year (sooner if Brett Gardner departs). I’d love for Dustin Fowler to find a way, but the $89 million man is blocking his way in center. The Yankees received the first of their Rule 5 losses back, but unfortunately, it wasn’t one of the guys I am hoping for. The Arizona Diamondbacks returned right-hander Tyler Jones. At 27, Jones can’t rate as much of a prospect but he did put up solid numbers in the minors last year. Jones pitched 8 games for the D-Backs this spring for 6 2/3 innings. He failed a couple of save opportunities, and finished with a 4.05 ERA. To his credit, he did strike out 8 batters. It’s possible that we may see Jones in the Bronx for short stints via the Scranton/Wilkes-Barre shuttle this year. Meanwhile, I continue waiting to see if Luis Torrens (San Diego) and/or Tyler Webb (Pittsburgh) will be returned. Although I’d like to see both players back, it is very possible that one or both will be lost if they make Opening Day rosters (of course they do have to stick all season at the major league level or must be offered back to the Yankees). In yesterday’s Grapefruit League action, the Yankees won again. They scored an improbable come-from-behind victory over the Philadelphia Phillies, 3-2, with names you definitely will not be hearing in the Bronx this year. Trey Amburgey delivered the game-winning RBI with a single in the bottom of the 9th, scoring Wilkin Castillo. Sabathia started the game and went 5 1/3 innings. He allowed 9 hits but only gave up 2 runs as he worked out of trouble a few times. Severino finished off the game with his masterful final three innings of no-hit ball to pick up the win. Dellin Betances made his first appearance since the WBC for two outs in relief of Sabathia. Aaron Judge’s arm also showed why he should be the team’s starting right fielder. The Yankees are now 20-7-1 as we begin the final curve before the home stretch to Opening Day. Next week should be very interesting as the Yankees begin the final cuts in the march to 25.